Home » All white goods Articles » Washing Machines » Installing & Connecting washing machine » How do you blank off the old hot water tap? How do you blank off the old hot water tap? The information in the first paragraph below is from my original article. It shows how to blank off the old hot water tap on a washing machine. Virtually all washing machines are cold fill only now. So they only have one water valve. But most homes have plumbing for both hot and cold fill hoses. It’s not ideal to just leave the old hot tap. It could get knocked or start leaking, so best practice was to blank it off. However, make sure you read the rest of the article too because this is no longer the ideal best practice. Just blanking off an unused tap can lead to stagnant water building up. I visited several major DIY stores including Wickes and B&Q trying to find a blanking cap for my old hot water tap. They only seemed to stock one blanking cap that looked anything like what I was after but after buying it and opening it, it was just fractionally the wrong size. Presumably it’s designed to cap off some other plumbing requirement. If I remember right I think it was 22 mm – I can’t recall, but I remember taking it over to an actual hot tap at Wickes and through the plastic packaging of both parts it did appear to be the right size. It wasn’t. 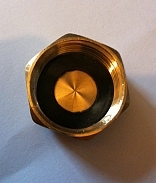 The size you need if you want to try and source one from a shop is – 3/4″ Brass blanking cap and washer (which is around 19 mm). You could also try searching Google for “3/4″ Brass blanking cap and washer” or specifically ask for that at DIY stores or plumbing merchants. The rubber seal is needed for proper sealing off of the old tap but if you don’t get one, try using one from the old hot fill hose. Screwfix currently sell a washing machine blanking cap 3/4 “. There’s no mention of a seal but people aren’t complaining about it in their comments. This used to be a straightforward issue, but it’s been complicated by new information regarding a theoretical health hazard. The advice has always been to simply cap off the old hot water tap by screwing a special blanking cap onto it (details below). This would seal off the old tap and prevent accidental activation or leaks. As far as I can see this is what virtually all plumbers are still doing. However, simply blanking off the old tap is now brought into question due to concerns about what are called “dead-legs” in plumbing. Capping off unused taps causes these dead-legs where plumbing goes to a dead end and water never flows through it again. The water trapped inside becomes stagnant and never gets replaced. If temperatures allow, bacteria and other micro-organisms can start growing in there creating a serious health risk. This can create contamination of the rest of the water supply if some of it breaks away and joins the rest of the flowing water. What are the possible health hazards? The issue with the hot water supply is potentially more serious because hot water is used in mixer or power showers, and the deadly Legionaries disease is notorious for being spread by airborne droplets if breathed in. However, my understanding is that if water is 60 ° C the bacteria cannot survive (which is possibly why public showers are always too hot these days). How real is this issue? This is completely new to me, and not really the remit of a repair engineer. However, I’ve spent a few hours researching, and there are credible sources (including government web sites) that warn against redundant pipework (dead-leg), and link it with Legionaries disease. That said, I’ve also seen a site that claims copper pipes inhibit the build up of bacteria. So is this really a real and present danger requiring millions of homes to employ plumbers to remove all the old washing machine hot water pipework as soon as possible? That would be quite a story. I suspect the risk may be small – I’ve certainly not heard of any health cases and dead legs are clearly very common – but it is definitely something to consider. All of the information I have found so far (including the quotes below) is advice aimed at people in charge of buildings (including landlords), employers and councils etc. I’ve found no advice aimed at informing us the general public. As yet there seems to be no recognition of the fact that over the last 10 years or so, since almost every washing machine stopped using hot water, millions of homes have newly created and often long runs of dead-leg pipework . The overwhelming majority of UK homes now have dead leg pipework running to their washing machines. I am still trying to find out some definitive facts about this subject and will update this article whenever I find new information. 2.77: Consideration should be given to removing infrequently used showers and taps and where removed, the redundant supply pipework should be cut back, as close as possible, to a common supply, eg to the recirculating pipework or the pipework supplying a more frequently used upstream fitting. 2.78: The risk from legionella growing in peripheral parts of the domestic water system, such as dead legs off the recirculating hot water system, may be minimised by regular use of these outlets. When outlets are not in regular use, weekly flushing of these devices for several minutes can significantly reduce the risk of legionella proliferation in the system. Once started, this procedure has to be sustained and logged, as lapses can result in a critical increase in legionella at the outlet. Where there are high-risk populations, eg healthcare and care homes, more frequent flushing may be required as indicated by the risk assessment. An article on this site here starkly states that dead legs in pipework are a major cause of Legionnaires’ disease UK urged to follow Europe and tackle dead leg plumbing. I’ve no idea how likely or rare this, and it does seem a little over dramatic – but for now it is wise to be aware of the potential issue, and best practice should be to have any redundant pipework removed altogether and capped off. This unfortunately means most people will need a plumber and have an unwanted expense so it is quite likely that most people will never bother to do it unless there is a highly respected source (such as government or Which?) warning about it. I suspect many plumbers are unaware of it even. Could hot and cold fill washing machines come back? Another issue likely to cause reluctance is that you might not want to have the pipework removed in case it is ever needed again in the future. This may be unlikely being as virtually all washing machines are cold fill only and have been for many years. However, it’s not difficult to imagine a reversal of this practice and a return of the hot water valve on future washing machines. I have personally pointed out several good reasons for reintroducing the hot water valve in my article on cold fill washing machines. It would be very annoying to have all the pipework removed only to find your next washing machine uses hot water again. Having said that, health and safety is always an overriding concern. So there is the dilemma. Current advice says that any existing dead leg pipework should be flushed at least every 7 days to remove any growth of bacteria and other micro-organisms. This would involve leaving the hot water hose connected to the hot tap and every 7 days placing it into a bucket and running the tap until piping hot water flushed through. This is clearly a highly unsatisfactory situation and unlikely to be taken up and carried out religiously by anyone but it is technically a potential solution. All the facts that I currently know are here. I’ve also found an article that claims copper pipework restricts and suppresses the growth of biofilm but it doesn’t say it completely removes it – Legionella & Copper Plumbing. Information also says the legionella bacteria can’t survive above 60 °. But how can we be sure that our hot water is actually 60 ° and even if it is, much of it in the lower section of hot water cisterns and all over the pipe network spends long periods below 60 °. I am still researching this issue, if you have any expert opinion or any thoughts please add a comment or contact me, and keep watching this article for updates. My own washing machine’s old hot tap is blanked off, and has a long run from under my sink into the garage which is quite a long dead-leg. However, although I remain concerned I haven’t (so far) done anything about it as without any proper authority advising about it, it seems more of a theoretical risk. Most of the comments below were added before this article was completely rewritten and refer only to the blanking off cap. They may still be useful as most people are still likely to want to just blank it off. do you fit this after the pre-existing tap (ie leave the old blue/red handle control where it is) or do you have to remove the old control piece? You just unscrew the old hot fill hose from the tap and screw the blanking cap on in its place, and of course leave the hot water tap turned off. Make sure the seal is fitted inside the blacking cap and tighten it firmly but there’s no need to use any tools, just nice and firm with the fingers should do. If you want to nip it up with some pipe pliers just nip it a millimetre or so past finger tight. My hot fill pipe doesn’t have a dedicated tap. Whoever plumbed it in didn’t fit one. The cold and hot fill pipes to the washing machine each share stopcocks with the cold and hot fill pipes to the kitchen sink taps which will obviously have to be switched on again after installing the new, cold-fill only machine. I presume the blanking cap will be sufficient to seal off the hot water pipe at the point where the old hot fill hose currently attaches but would welcome your advice. Hello John. Yes, the cap has the same thread as the old hot fill hose so when you remove the old fill hose you screw the cap on in its place. However, ideally you’d like the tap to then be turned off so it’s not under any pressure. If you can’t turn off this tap because it also supplies the sink tap you will have to rely on the rubber seal inside this cap preventing leakage. It should do, but keep a close eye on it for a few weeks at least. Just wanted to thank you for your help and advice. I bought the cap from the site you recommended. Excellent service – ordered Friday pm, delivered Saturday am. Fitted it Saturday and all seems fine. As you say, I will keep an eye on it for a while. Again, many thanks! Thank you for a very good and clearly written article, the information about the blanking caps was particularly helpful, and I have used your contact to order the caps I need. I also just wanted to say many thanks for this, my blanking cap arrived today from E-lectricalshop.co.uk and it fits perfectly (this followed on from 3 fruitless trips to different DIY stores before I read your article). Many thanks Joanna. I wrote the article specifically to help people like yourself after having a lot of problems trying to buy one myself and it’s great to get feedback that makes it worth while. Thankyou so much for this advice. I’ve been worrying about the un-used hot water pipe for exactly the reasons you cited as well as a whole load of others including random teenage guests of my daughter fiddling with the lever, boiling hot water spewing everywhere, flooding into the hairdressers shop below etc. I was actually on the verge of ordering a 22mm compression blanking disc from somewhere or other (having spent hours trying to work out what the damned thing is called) so you’ve saved me a great deal of hassle. I shall order the right one now. Really appreciate your advice. Thanks for the excellent advice. Have ordered a blanking cap today from E-lectricalshop.co.uk saving me the hassle of wandering around DIY stores hoping to find the right part. Just taking out my old machine to make way for new one arriving tomorrow. Old machine has hot and cold – new is cold only. However hot tap when disconnected from old machine and red “valve tap” is turned off still runs. HELP!?! Dont know why as this didnt happen before – any ideas or suggestions welcome before I have to pay a plumber a fee! Looking for the cap in white plastic, are they available? I wouldn’t think so Eric. I wouldn’t think there was a demand for white plastic ones. Sam: Chances are your tap is broken. It’s extremely common with the ubiquitous red and blue tabbed taps most plumbers use. The plastic used for the levers isn’t of good enough quality and they break. This results in you thinking you’ve turned the tap off but the plastic lever hasn’t really turned the metal valve. Either that or it’s turned it almost off but can’t turn it completely off because of another common problem with these taps where they go very stiff. The answer is to remove the plastic lever and use pliers to turn the tap off and then use the blanking cap. Otherwise you’d need a plumber to replace the tap. I can only endorse the comments above. I ordered from the supplier as suggested, and the part arrived in a couple of days and fitted perfectly. The internet, I’ve found, is a remarkable resource for self-help and self-instruction in so many areas, from advice on addressing nagging worries as in this case, or on sealing a shower tray, to finding recipes for baking terrific cakes and breads, but only because decent people who know what they’re talking about are prepared to share what they know. Many thanks. Thank you so much for the above information. I was a little dismayed when my new machine arrived this afternoon, only to be told I needed some cap that I had never heard of. It was such a help reading your advice, and even better, I discovered that I live less than 8 miles from their shop – so have just been there in person to pick up the cap. A friend has moved to a new house. She has an eight year old Indesit washing machine with both hot and cold fill. However, in the house she has moved to, the hot feed has been stop-ended. She is worried that she can’t use the machine with the hot fill hose attached or with an open fill hole if the hose is removed. Do you know if these machines have a non-return valve to prevent water being forced out of the hot fill hole? If not, do you know where we might be able to get a stop for that hole? Thanks in anticipation for any help you can give so that I could set her mind at rest. Ross: She can use it by connecting the hot and cold hoses to the single cold supply. This might help Is it possible to use a hot & cold fill washing machine with just a cold supply? Ordered one of the brass blanking caps from e-lectricalshop.co.uk on Wednesday afternoon, arrived this morning. Saved lots of time rummaging around the DIY stores trying to find the right one. I notice that it has a full rubber insert rather than the usual type washer – assume this is OK? Thanks Steve, yes I would presume it’s OK too. I would be lost if it wasnt for this guide! I cannot thank you enough for your advice here which I found via Google. I recently got a new washer with just a cold fill behind it instead of the old hot & cold. I recently noticed the floor getting wet around it and found the red plastic lever causing a drip. Getting to a DIY store is difficult at the best of times as I don’t drive so your warning there was timely. I followed your link to e-lctricalshop.co.uk – blanking cap (£2.99) came 2 days later and fits brilliantly. I’m not exaggerating to say you’re my hero for providing this valuable advice. Thanks to you this non-DIYer woman got this sorted out with little fuss. I have whitegoodshelp on my bookmarks list now! Thanks very much Gavin and Carol: This is proving to be my most popular bit of advice. I’m really pleased it’s helped so many people. Ordered Friday arrived Monday morning via Royal Mail. As a temporary measure you could use the old red or blue, round, plastic connector that came off the old hoses. By inserting a 10p piece into it,covering the hole, and then add the washer. This is what I did until the correct blanking cap arrived.